Sideways in Time: Comic Strip Time Team : Are You Listening? "They probably think I'm a city or something." 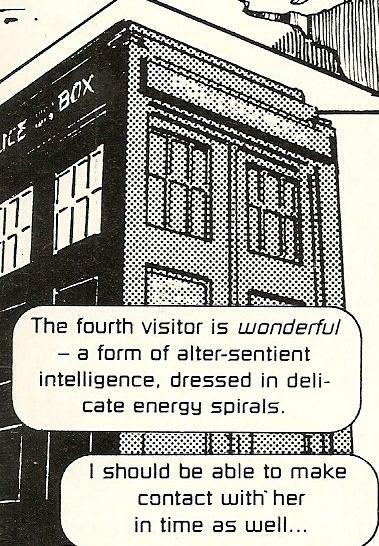 Story: The TARDIS crew arrive in what appears to be an abandoned, futuristic. Although the travellers don't realise it, the city is in fact a sentient machine-like being called Xenith. Xenith attempts to communicate with them but, misunderstanding Xenith's intentions, the time-travellers rush back to the TARDIS and leave. Xenith is alone again. Mark's Remarks: If you think that the above synopsis sounds like just half a story then you'd be right. The 1994 Summer Special had two 4-page comic strips: this one and Younger and Wiser, which picks up the story with the Seventh Doctor. Yes, that's right, once again the Seventh Doctor returns to sort out a mistake made by the First Doctor. 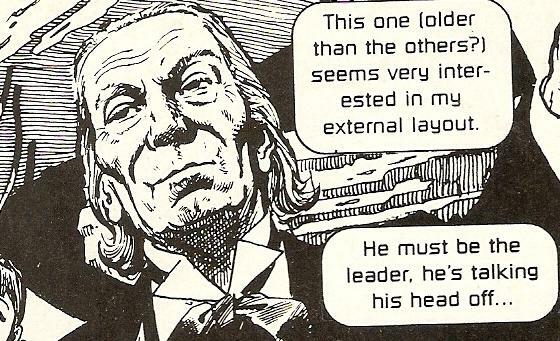 Although there isn't a great deal of continuity between these First Doctor strips (mostly because they're all written at odd times during the early 90s), one thing I have noticed so far is that Doctor is always portrayed as someone who doesn't like to get involved with things but will do so when pushed into it. The very minor issue I have with this is that, whilst this is standard behaviour for Hartnell's Doctor in the earliest days of the series, by the time we get to Season 2/Season 3 era where this story is meant to be set the Doctor has become a lot more proactive. By this point he's realised that his lot in life seems to be to help people and right wrongs. In short, he doesn't just run away at the first sign of danger. So it makes his actions here a little out of character. Still, what the heck, it's just a short 4-page story that really does little more than set up the aforementioned Younger and Wiser so I feel I should cut it some slack. Despite its slightness, there is some nice stuff here. I particularly liked how Xenith seems to be quite taken with the TARDIS - the closest we may ever get to the TARDIS having a secret admirer. What is also notable though, apart from the very nice artwork by Colin Andrew, is that this is the first appearance in this comic strip marathon of writer Warwick (later Scott) Gray. He'll go on to play a major role in the shaping of the 8th Doctor's comic era in what is considered by many readers to be something of a high point in the comic strip's history. But that is some way in the future.